November 6, 2013 (Alexandria, VA) -What&apos;s on trend this shopping season in Alexandria is ‘small is the new black&apos; - meaning holiday shoppers deciding to shop independent stores on Black Friday. Black Friday local edition returns in Alexandria on Friday, November 29th, with over 50 independent boutiques opening early to kick off the shopping season with one-of-a-kind shopping steals. Known as the regional destination to shop independent boutiques, Alexandria retailers will open early on Black Friday offering once-a-year deals sure to lure shoppers to Old Town, Del Ray, and other parts of the City. Participating stores will open at 6 a.m. offering 30% discounts from 6 to 8 a.m., 20% from 8 to 10 a.m. and 10% starting at 10 a.m. The City of Alexandria is offering free parking at parking meters and in all city-owned garages and parking lots as a special incentive for shoppers. The Free King Street Trolley will begin operating at 6 a.m. so shoppers can bag even more bargains. Shoppers can plot their Black Friday Alexandria game plan by visiting the Black Friday Alexandria website to preview what will be on sale at local stores prior to the big day, including designer brands like Hunter (shoes), Mauviel (cookware), Tory Burch (apparel/shoes), North Face (apparel), Chan Luu Wrap Bracelets, Lilly Pulitzer, John Robshaw (home bedding), Dash & Albert (home), and LK Bennett (shoes) to name a few. To make the shopping experience more enjoyable, several eateries will be opening up early to satisfy shoppers hunger pains. For example, Misha&apos;s Coffee will open at 6AM for shoppers. Jackson 20 will be hosting a Black Friday Brunch (7:00AM-2:30PM), Society Fair opens at 7AM will offer 10% off all day and Union Street Public House is opening for breakfast on Black Friday at 9AM offering shoppers 10% off meals. Shoppers can stay for the popular City of Alexandria Annual Tree Lighting Ceremony at 6 p.m. on the picturesque and historic Market Square. As the official kick-off to the holiday season in Alexandria, the ceremony includes a visit from Santa and Mrs. Claus, performances by the Alexandria Harmonizers and the Alexandria Choral Society, caroling and a community sing-along. Santa and Mrs. Claus are back in Old Town Alexandria to take pictures with children every Saturday and Sunday between Thanksgiving and Christmas. This is the fourth year of Black Friday Alexandria. Each year, participating stores and the City have seen a continuing increase in sales and foot traffic in Alexandria on Black Friday. Black Friday Alexandria provides a calmer setting and enjoyable alternative to the traditional Black Friday mayhem at big box stores. Shoppers can purchase unique shopping treasures, support the local community, stroll down beautiful cobblestone streets, grab a bite at one of the City&apos;s eateries and overall enjoy the seasonal cheer of the City. For those that might miss out on Black Friday deals, they are encouraged to support local businesses on Small Business Saturday (Nov. 30). 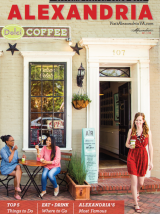 Along King Street, 77% of the businesses are independently or family owned. For more information on participating business and general event information, visit www.blackfridayalexandria.com. Named a Top 10 Christmas Town by HGTV and a "quintessential holiday getaway" by Baltimore Magazine, Alexandria, Virginia dazzles visitors with twinkling trees that illuminate Old Town, ample holiday events, boutiques and restaurants buzzing with seasonal cheer and Santa Claus welcoming families with warm wishes. For a complete guide to holiday events, shopping and more, go to VisitAlexandriaVA.com/holidays. Time: Participating stores will open at 6 a.m. offering 30% discounts from 6 to 8 a.m., 20% from 8 to 10 a.m., and 10% starting at 10 a.m. Free parking at parking meters and in all city-owned garages and parking lots. Free King Street Trolley will begin operating at 6 a.m.